Thanks to a newly renewed grant, and just in time for Indigenous Peoples’ Day, the Sapsik‘ʷałá program in the UO’s College of Education will be able to support 14 Native American students over the next four years. The $1.2 million grant is funded by the U.S. Department of Education’s Bureau of Indian Education. In return for receiving the program’s benefits, students commit to teaching in schools with significant number of Native American students. Sapsik‘ʷałá provides fellowships and a book allowance for Native American students seeking a master’s degree in education and a teaching license. To date, the program has graduated 77 indigenous students who have gone on to teach and make an impact in tribal communities. The goal is not just to educate Native American teachers about how to work with native students, but to educate all graduates about how to serve indigenous communities. The program’s size has fluctuated with funding levels over time, so successfully renewing these grants is vital to its continued success. Recently, when federal funding was unavailable, the UO stepped up to provide bridge funding. “We dream one day of having a motivated donor endowing these fellowships so we are not dependent on the vagaries of federal funding,” Rosiek added. 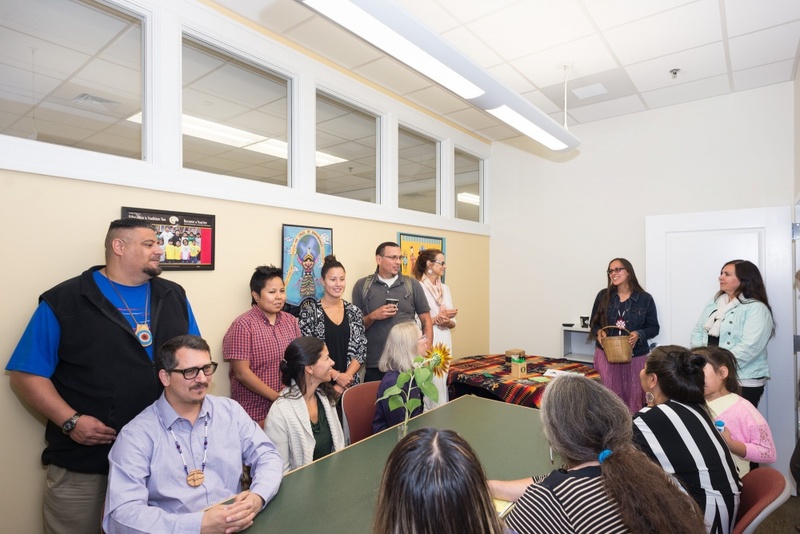 The relationships between the College of Education and Native American community partners, including the Sapsik'ʷałá Advisory Council, have bolstered the program’s reputation and maintained a 100 percent graduation rate and 97 percent licensure rate. This reputation benefits the program in other ways; three Sapsik‘ʷałá graduates have returned to UO to get doctoral degrees in education, and five other Native American students have been attracted to doctoral programs at the UO. One recent indigenous graduate, Leilani Sabzalian, has won multiple national awards for her work. Rosiek said the program is on its way to having the highest rate of graduating Native American students with doctorates of any graduate program in the Pacific Northwest. Michelle Jacob, a Yakama tribal member and an associate professor of indigenous studies, is the new director of Sapsik‘ʷałá. “Sapsik'ʷałá” means “teacher” in Ichishkíin-Sahaptin, an Indigenous language shared by several Northwest tribes and taught at the University of Oregon. The spelling utilized in this article represents the Umatilla dialect.